What Did We Learn From Today's Heat-Celtics Game? The Miami Heat have been surging for weeks (winners of eight in a row before today), playing as good as any team in the NBA and finally overcoming Boston for the best record in the Eastern Conference.Just in time for the Celtics to put them back in their place. Boston just beat Miami for the third time this season. It was the closest of their three contests, but all the signs still point to the Celtics’ experience and toughness winning out over my Miami’s flash and skills. Just as it will in the playoffs. Of course, Miami is clearly better now than when Boston dispatched them earlier in the year. 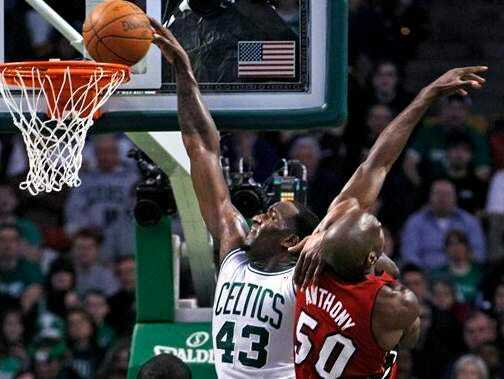 The Celtics roared to a double digit lead in third quarter, but the Heat clawed back. They eventually solved (sorta) the Rajon Rondo problem (the trick: “stop playing defence on him”) and had more than one chance to win it in the end. BUT: All the problems that have plagued them in close games against quality teams are still there. LeBron James went to the free throw only twice (suggesting that unlike other stars of his calibre, fame wins him no points with the officials) and one of those trips was to miss a potential game-tying free throw. Neither James nor Wade nor Bosh got his hands on the ball on the final possession. The defence is better, but when a basket is needed, no one seems to be able to get it. But the playoffs are still month away, right? If they keep improving at this rate, eventually they’ll get better than the best, right? That the order of things is the same order it’s been since Opening Night doesn’t really matter, right? Please hold your breath until June.